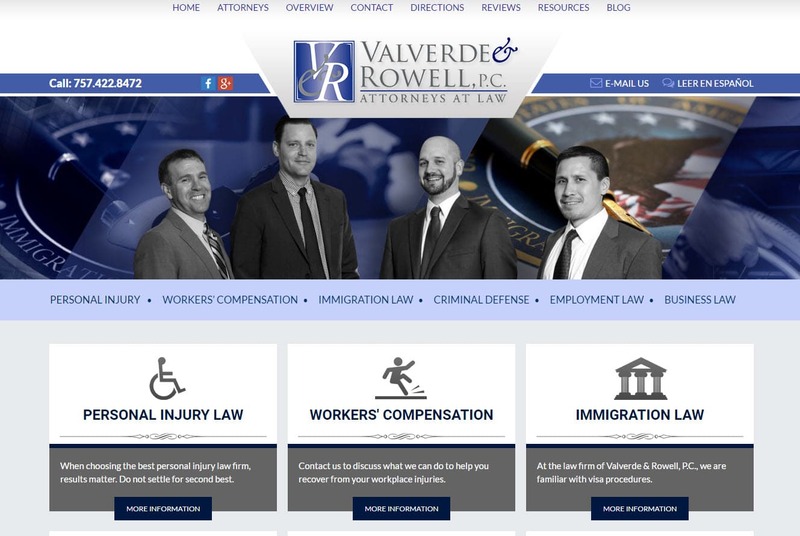 Website Design Virginia Beach, Web design Virginia | This Virginia Beach attorney firm approached VISIONEFX to redesign their WordPress website after noticing they were falling back in the Google page rankings. Using WordPress CMS and custom design and advanced SEO we redesigned and recoded the website. The website also features a Spanish language tab. Valverde Rowell has offices located in Virginia Beach, VA. When searching Website Design Virginia Beach, Web design Virginia look no further than the web design experts at VISIONEFX. Our search optimization experts are always on top each new algorithm change and SEO tasking to provide successful SEO outcomes for our clients. We understand its one thing to have a great web design but without great SEO your website is invisible online.Our Web Design & SEO experts use the latest tools and software to get you the results you need to compete online. We will analyze your web site and put together a SEO strategy that is customized for your online web marketing. VISIONEFX also offers monthly SEO maintenance services as well so you can maintain your search engines positions. Let us Maximize your online potential. • Web updates maintenance services.